To operate the VM inconspicuously, obviously you don’t run the full-fledged VirtualBox GUI. VirtualBox can also be fully managed from its command-line interface, called VBoxManage (you can read the User Manual if you want to learn more about VBoxManage). In what follows, I will discuss how you can set VirtualBox to run in headless mode, and also how to set the virtual machine running pfSense to automatically enter the ‘saved state’ mode when you shut your Windows host down, and how to make it automatically start again when you boot your host. Firstly, I need to say that I have spent quite a few hours trying to figure out on my own how to run VirtualBox as a service, so it can detect power events on the host, such as shutdown, logoff or startup. Especially the shutdown / logoff part. No, don’t even think about Group Policies, since in Windows 7, during shutdown, all programs are closed first and only afterwards it runs whatever scripts we set. Which means that we cannot tell VBoxManage or VBoxHeadless to nicely shut down our VM or to save its state. The best bet is VBoxVmService, developed by an enthusiastic VirtualBox fan and available for free on Sourceforge. Download the latest build here and after unzipping it, read the Howto in the docs folder. It is very explanatory and simple. By the way, don’t fret if the service does not start your VM right away so don’t try yet to debug it; just reboot after installing the service. Still, the service is set for delayed start, so your VM will not start right away after your Windows boots. I didn’t quite like the idea, so in the VBoxVmService.ini file (you’ve read the Howto for VBoxVmService, right?) I have set my VM’s AutoStart option to no, and then created a small VBScript file to execute automatically at startup. It is a much faster option. Note: C:\Program Files\Oracle\VirtualBox\ is the full path for a default VirtualBox installation. If you changed its location, you need to modify the path in the script accordingly. cmd = chr(34) & "C:\Program Files\Oracle\VirtualBox\VBoxHeadless.exe" & chr(34) & " --startvm" & " pfSense"
If you have Windows 7 Professional and up, or Vista Business and up. 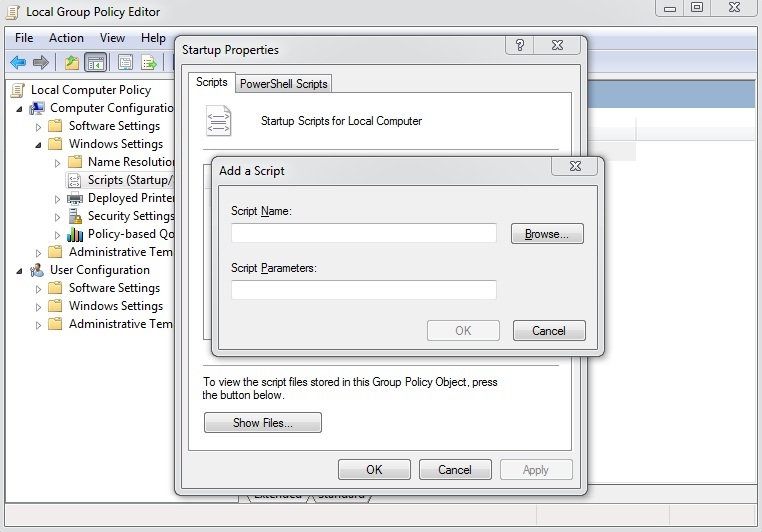 Run the Local Group Policy Editor as administrator (the easy way: click the Start orb and type in the search box gpedit.msc). 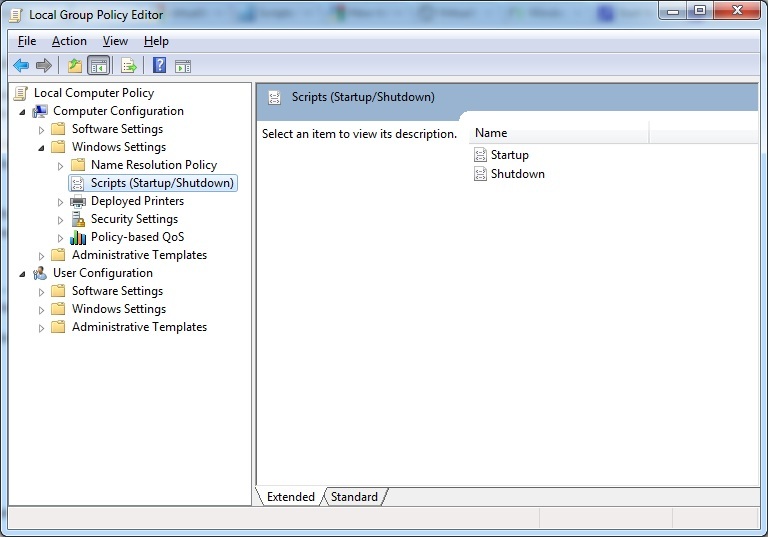 Go to Computer Configuration > Windows Settings and left click Scripts (Startup/shutdown). Click OK, and then OK again. If you have a Home Edition of Windows 7 (or Vista). Copy the VBS file in C:\Users\[yourusernamehere]\AppData\Roaming\Microsoft\Windows\Start Menu\Programs\Startup. This will work only for the specified user. Still having problems? Check on SevenForums.com for a wealth of advice on how to run programs at startup in Windows 7 / Vista. cmd =  chr(34) & "C:\Program Files\Oracle\VirtualBox\VBoxManage.exe" & chr(34) & " controlvm" & " pfSense" & " savestate"
cmd =  chr(34) & "C:\Program Files\Oracle\VirtualBox\VBoxManage.exe" & chr(34) & " controlvm" & " pfSense" & " reset"
cmd =  chr(34) & "C:\Program Files\Oracle\VirtualBox\VBoxManage.exe" & chr(34) & " controlvm" & " pfSense" & " acpipowerbutton"
Thanks Manuel. This is a remarkable guide which is very easy to follow. I have some questions as to how some things work for other VMs on the host. Its important for traffic to be separated because I tend to test malware in the guest OS and would need to ensure that there is no possibility for cross contamination through netwroking. Is the only way to accomlish this through VLANs? Does there have to be hardware support for VLAN tagging for this to work? Please post instructions on how I could go about doing this or even a tutorial would be very much appreciated. To make sure that the vm cannot communicate with the host I initiated ping tests, while temporarily disabling the firewalls on both systems as to not distort the results. 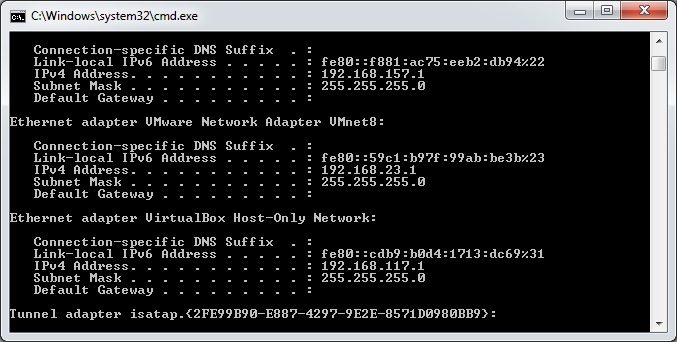 xp vm has only (1) and also primary NIC set to use the WAN wirless interface in bridged mode. -PF can ping xp vm on both the LAN and WAN <- which confuses me since I thought that the xpvm was supposed to be considered as only on the WAN side of PF since I didn't configure for it to use the loopback interface. xp vm is set to use 2 NICs; The primary WAN which is bridged ot the wireless card and also the MS loopback for LAN as the second interface. – Can I correctly assume that the configuration described in the first test ensures that the vm cannot talk to my host by any means? What throws me off is that PF sees the guest OS appears to be responding from both sides of the firewall, while the guest's communication is only one sided as in the case of Test 1. If you have no desire to explain this, please let me know. I've posted this question on various forums (including pfsense) and never got any feedback. Then I thought it would be best to ask you here, even though I thought that you stopped writing for a while. Since my comment appeared you appear to regularly check on your site so you've probably seen my question. This seems very complicated and I'm about to give up. Thank you for stopping by. I’m glad you found this tutorial helpful. To answer to one of your questions from the first post: I am not sure whether VLAN tagging would be of much help anyway; it has not been designed as a security measure and it is exposed to malware that propagates through VLAN hopping. VLANs seem to be trusted too much when it is about network security. Better think security in depth, rather than through segmentation. I will take a closer look at your tests and what you are trying to achieve and then come back with a more comprehensive answer. The problem would be similar to a physical lab in the end, so the same defense principles apply, thus it is worth considering. To put it right, with VMs you are at risk of ‘leaks’ anyway, as a principle. I.e. can you know for sure that some malware you are playing with doesn’t exploit a 0-day vulnerability in VirtualBox / VMware, and thus bypass the sandbox other way than through the network? Some worms can be really good at identifying whether they are running within a virtual machine, and thus look for exploits (for instance, the I/O ports used for communication with the host could be a target). Or they may render your testing redundant by deactivating themselves. The days before Christmas are quite busy, and to a certain extent you are right – this blog is not my main concern right now – but I’ll get back to you within a couple of days. I am considering making use of virtualbox’s internal networking for isolation instead of vlans, but to no avail (guest os doesn’t see the virtualbox internal Intel NIC) . Since i’m not knowledgeable enough nor do i know if this is the anwser, I’ll just wait and see what you make of the test results first. 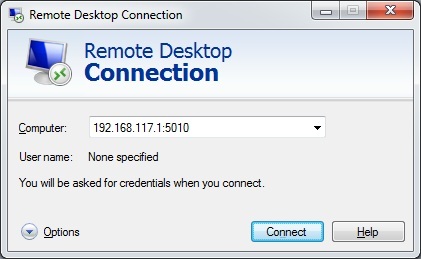 Great tutorial, all work perfect…until the end, i could not connect with remote desktop. i can ping the Vbox address but cant connect to it(i append the port number as in the example). Error that remote access is not enabled or machine might be off, or cant reach it on network. Did you enable the Remote Display server as explained in Part 4? I know, you say that you’ve followed the tutorial, but just make sure that you’ve ticked that box. Also, you may want to check your Windows Firewall settings (which may not allow RDP connections to a non-standard port or any RDP connections at all). Thank you so much Manuel ! Your tutorial is awesome ! I cannot see more useful 128Mb in a windows box ! I’m glad it worked for you. Thanks for the kudos! Thanks for the tutorial. I’ve wanted to muck around with pfSense for some time and this came in just handy. Thanks for the tutorial. I’ve managed to configure it just as your tutorial suggests and it works fine. Could you please do a tutorial on port forwarding. I’m planning on setting up a real PFSENSE firewall/router to sit in front of a mail server (kerio mail) and a web server. i use pfsense as secondary router (shall i say proxy router) in my home with lusca cache on it for my ISP is no good at all. i did not install ms loop back (just already discovered when i read your tutorial). I’m combining what you’ve described here with multi-wan, to make one of my laptops able to deal with multiple wans coming in, then act as router on local lan…there’s a video on you-tube that shows how to setup multi-wan, I’ve followed it before and successfully been able to failover, load balance and increase bandwidth with multiple connections via pfsense. Thanks once again, great stuff, wish I was as organised as you ! Very nice tut, taught me alot about networking. I have some points I wanted to ask about and will put them in bullet points to be concise. There is one thing that I’m very worried about though. 1- Is my host NIC drivers protected from malicious frames after I set this up? I am worried after having read about something like this from a researcher on Blackhat. Lets say my threat model does not include a targetted attack, which is inescapable and would be the least of problems if a powerful group is behind it. 2- Do you know of any automated layer 2 attacks, like the one described above is done by worms? I am trying to guard my host against infected laptops sharing the same public wifi I am using and also from any infections on my guest vms. 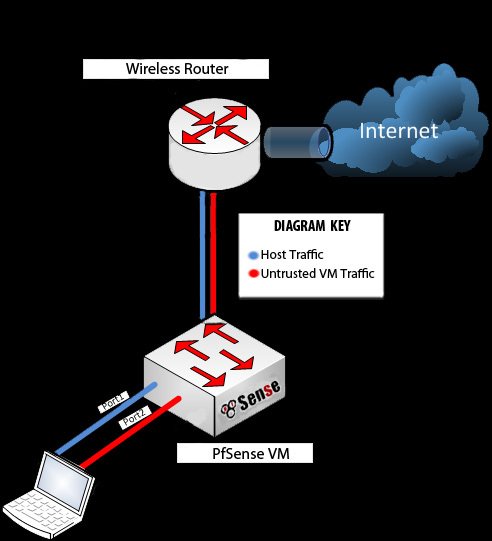 3- Would placing an untrusted guest vm behind pfSense thwart malicious frames sent via the data link layer – not packets? I know these are a lot of questions, but I am very anxious about this and would be grateful if you can anwser them. Now, I want to cut windows from the internet, except for windows update (I guess I can do it in pfsense via Squid) and instead surf the web with my VM2 (Linux). Will it be possible to tell VM1 to feed internet on VM2? Sorry, for now I am really busy and I cannot reply to comments individually. If I have TCPIP on my Physical NIC then I can access both my router’s and PFsense configurator and I can see in my router’s info that PFSENSE did connect via 192.168.1.7 but all is lost if I untick TCPIP. Can you advise me where I went wrong?